The monument commemorates the most highly decorated Australian infantry battalion of World War One. 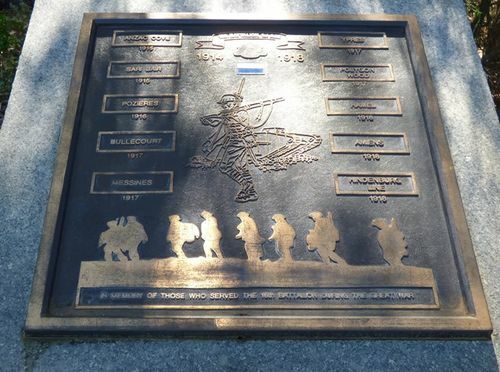 The plaque mounted on the granite pedestal records the ten major battle areas in which the Battalion served, from Gallipoli in 1915 to the Hindenburg Line in 1918. The 16th Infantry Battalion Australian Imperial Force (A.I.F.) was raised at Blackboy Hill Camp, Western Australia on the 16th September 1914, forming part of the 4th Infantry Brigade of Australia`s newly raised force for overseas service. The Battalion consisted of men from South Australia and Western Australia. The 4th Infantry Brigade became part of the Australian and New Zealand Division and carried out months of strenuous training in the Egyptian desert around Heliopolis camp. The Battalion was landed late on 25 April at Gallipoli and reinforced the line at Pope`s Hill. It landed with a strength of about 1000 men, but by dawn on the 3rd May, after an attack on `Baby 700`, it numbered 309. The Battlion saw further action at Quinn`s Post, and in the area towards Suvla, including the unsuccessful attack on hill 971. Three Victoria Crosses were among the 322 bravery awards made during various World War One campaigns. In memory of troops who served in the Western Australian Battalions bearing the numeral "16"